As ever, the net-savvy and forward-thinking Comune of Matera have decided to use Open Data Day to promote the ancient city. Back in October 2014 they launched “Open Matera”, a competition in three categories – Contribution, Visualization and Application – each aiming to help the general public to discover more about the city using digital resources. The grand winners were GTFS Maker, who created a method allowing citizens to map the public transport lines of any city on openstreetmap.org. Here is the link for the open street map for Matera. 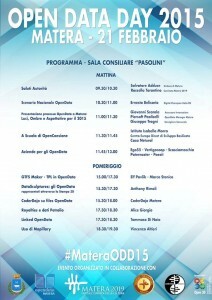 This is the second year that Matera has taken part in Open Data Day and their Facebook page tells people how to get involved. There is a programme of events on the page too, so there is no excuse not to participate!